The Crooked Banana: Scrappy Chevrons Top- Finished! As promised, a big finish! Okay, it could be bigger. 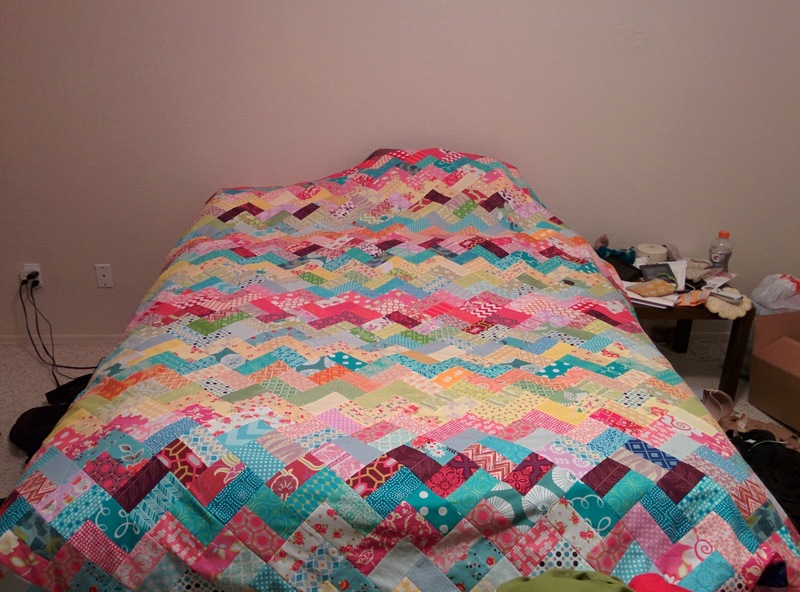 I just haven't mustered the courage to baste this gigantic monster, so it isn't quilted. But still! This has been in progress so long, it still feels like a huge accomplishment! So we moved so he could stand on the circle of bricks around the tree. Didn't help as much as we'd hoped! But that's okay. You get the idea, right? And in case you were wondering how big it is... here is the phone picture I snapped right after sewing and pressing the last seam. Please excuse the mess! We have still not finished unpacking and setting things up and the bedroom is probably the worst! There is plenty of drapage over each side of the bed. I think my sister will be pleased. Linking up to TGIFF, hosted this week by Lorna of Sew Fresh Quilts! It's looking gorgeous! Your sister will be delighted! Such bright scrappy goodness! I love it! LOVE the colours! It looks amazing! Fab! You played nicely with the colors. Well done! Found it! How pretty - - - I'm sure your sister will love it!